Proposed Plan of Improvements of Reservoir Park. This is a rare and beautiful 1871 map or plan of Reservoir Park or Bryant Park by Kellogg and Pollard. The plan covers what is today known as Bryant Park, located in Midtown Manhattan. Before Bryant Park became public property in 1686, it was a Native American hunting ground. It was later used for military drills during the Revolutionary War and a Potter's Field from 1823 to 1840. In 1847, after the Croton Distributing Reservoir was built where the main branch of the New York Public Library stands today, the site was named Reservoir Square. It was here in the western part of Reservation Square, where in 1853 the Exhibition of the Industry of All Nations, was held in the new glass and metal New York Crystal Palace, a replica of the London World's Fair Crystal Palace. The Latting Observatory, the city's tallest building at the time, stood next to the Crystal Palace. Both structures would be destroyed by fire in 1858. The Square was designated a park in 1870, and in 1871, it underwent a renovation. This plan, by Parks Engineer in Chief M. A. Kellogg and Acting Chief Landscape Gardener E. A. Pollard features the plans for the 1871 renovation. 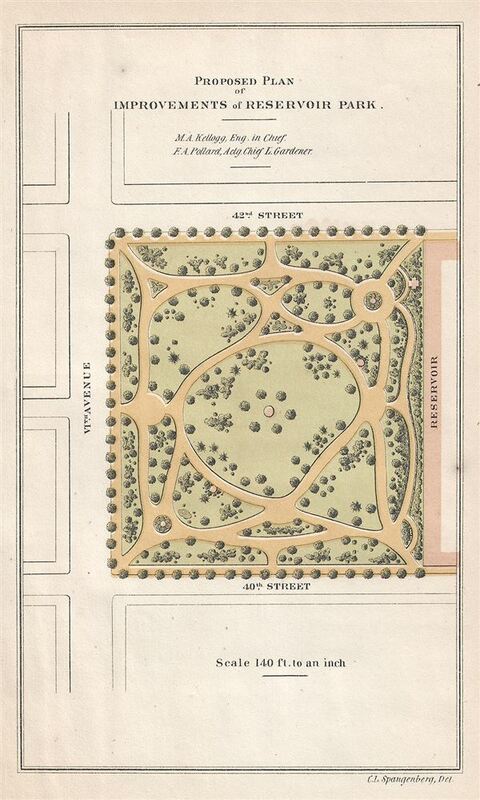 In 1884, Reservoir Park was renamed Bryant Park and would go through further redesigns and renovations to become what is today one of New York City's most popular parks. This plan was created by M. A. Kellogg and E. A. Pollard for the First Annual Report of the Board of Commissioners of the Department of Public Parks for the Year Ending May 1, 1871. Maps of Bryant Park are exceptionally scarce, making this a rare find and an important addition to any serious collection focusing on New York City. Very good. Minor overall toning. Minor spotting at places.